Jesus came, to link us to God the Father. "Jesus came, to link us to God the Father." There is an interesting portion in the bible, from the lips of the Master Jesus Christ. Teaching on prayer in St John’s gospel chapter 16 from verse 26, He says “at that day ye shall ask in my name”. He is talking about the day of the church, the new dispensation, when the New Testament comes and that’s the day we are living in today. So when He says “at that day ye shall ask in my name”, He means we are going to pray in his name i.e. in the Name of Jesus. There are those who think we can’t approach or talk to God directly. But we can! That’s why Jesus came, to link us to God the Father. And that’s exactly what he is talking about here. He says “when you pray in that day, you pray in my name and I am not telling you I am going to pray the Father for you.” Why is that so? In the next verse He says “for the Father himself loveth you, because ye have loved me and have believed that I came from God.” Jesus always wanted us to know that the Father loves us. So when we pray in the name of Jesus, the Father gets it directly and He responds because he loves us. St John’s gospel chapter 16 from verse 26, He says “at that day ye shall ask in my name”. He is talking about the day of the church, the new dispensation, when the New Testament comes and that’s the day we are living in today. Join me in prayer now. You can stretch your hands towards the screen and expect a miracle. 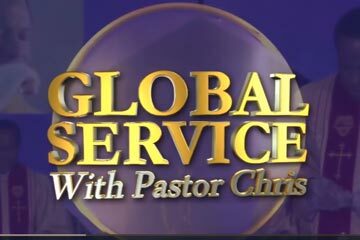 I pray that the hand of God will rest upon you right now.I command sickness, disease and infirmity of the body to leave you and the pains to seize. I command that cancer to leave you in the name of Jesus and that growth to dematerialize and you be healed. I pray that the growth in your spine will leave now in the name of Jesus. Be healed in your body. Right now, you say, 'In the Name of Jesus, I receive healing into my body. I receive the power of God into my body'. Receive that power now! You are healed, cleansed and made whole by the power of the Holy Spirit, in the name of Jesus, Amen. I thank God for healing you. He’s done it. Call us on telephone or send us an email. We’ll be glad to hear from you. And remember, we have materials to help you grow and to strengthen your faith. 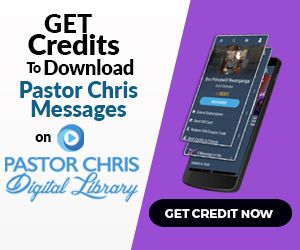 You can find several of them on the Pastor Chris Digital Library app, available for download on the Google Play and Apple App stores. There is one titled 'Authority in the name of Jesus', an inspiring teaching on how you can use the name of Jesus to live a life of victory, from day to day. I will see you again, until then, keep living in a Atmosphere of Miracles!